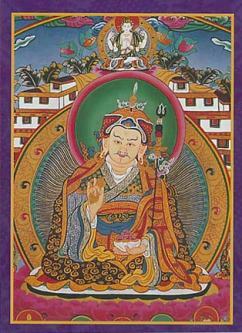 Avalokiteshvara Tibetan Buddhist Greeting Cards : These colorful greeting cards feature images from Tibetan Buddhism, in particular the major deities found in Mahayana Buddhism in Tibet and Nepal. Each card explains the meaning of the deity depicted on the card, but the inside is blank so you can compose the perfect note to a loved one or friend. 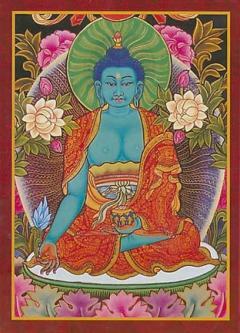 Avalokiteshvara (known as Chenrezig in Tibetan) is the Bodhisattva of Compassion and Protector of Tibet. The Dali Lama is considered to be the earthly incarnation of Avalokiteshvara. 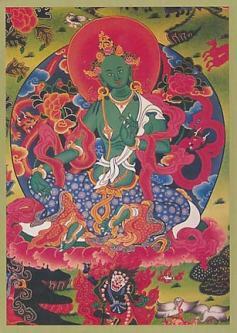 The thousand eyes of Avalokiteshvara help him to see the suffering in every corner of this world, while the thousand arms allow Avalokiteshvara to help on sentinent beings in the universe. Avalokiteshvara has 11 faces, the top one being Amitabha, the Buddha of Infinite Light. The two fron palms clasped together hold the precious jewel of enlightenment, which symbolizes compassion for all beings. In China, Japan, and Thailand, Avalokiteshvara is represented by the female Bodhisattva Kuan Yin.